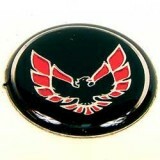 This is a new reproduction swirl bezel inlay for 1970 – 1981 Trans Am and Firebird. This is NOT a decal but indeed a unit produced from aluminum like GM factory units! This is a new reproduction center console for 1970 - 1981 Trans Am. Finally, a chance to scrap that old marred and burned up old center console and replace it with a clean fresh one from Fbodywarehouse. Available in black only, however, we do offer a complete line of interior dyes to match most GM interior colors. ***PLEASE NOTE, THESE WILL FIT ON 80-81 TRANS AM AND FIREBIRD, BUT THE FRONT MAP POCKET AREA IS DIFFERENT. We can redye for you also! See below for various color examples! 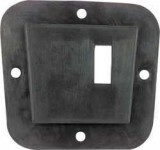 New reproduction gearshift boot plate for 73-81 Camaro and Trans Am with 3 or 4 speed manual transmissions. An OER reproduction, this is a perfect addition to your restoration. Unit seals the rubber shifter boot to the floor mounted transmission shifter hump. This seals off the area from heat and engine, road noise. This is a new OER console backer plate for 70-81 trans am and 73-81 camaro. 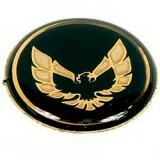 New reproduction gold bird shifter button inlay for 1970-1981 Trans Am installs on shifter knob. For use factory on 1976 1977 1978 1979 1980 1981 Trans Am Special Edition Cars with Automatic Transmission Excellent color quality and enhances the look of your cabin interior.Installs in seconds at home. This is a new 9 piece shifter set for 1970-1981 Trans Am with 4 speed shifter. This is a great product for the person who wants to retain their factory radio in the dash board but wants the convenience and quality of a modern radio. 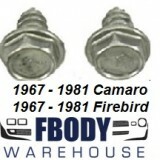 For use on 1970 - 1981 Trans Am and Firebird models. 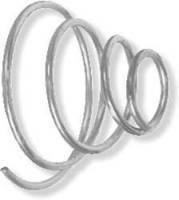 This is a Shifter Hog Ring for 1970-1981 Camaro and Trans Am. 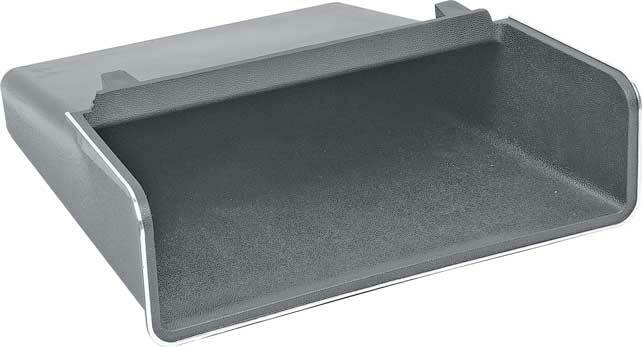 Console mounting kit for 1970-1981 Trans Am or 1973-1981 Camaro. 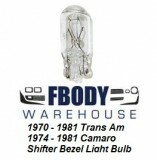 This is a replacement bulb for 1970 – 1981 Trans Am or 1973 – 1981 Camaro Shifter Bezel Light. 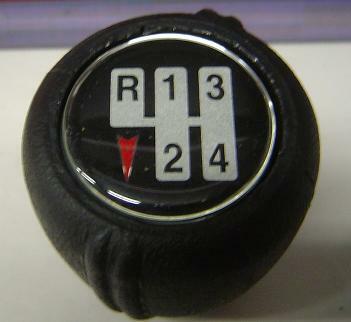 This is a 1970 - 1981 Trans Am 4/Speed Shifter Knob. This is a NEW Hurst 4 Speed Shifter Knob for 1970-1981 Camaro and Trans Am. This is a 100% complete fully pre-assembled center console bin set for 73-81 Camaro and 70-81 Trans Am. 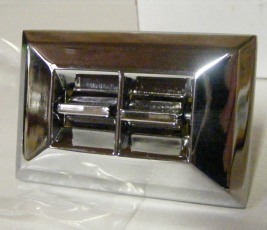 This is a center console gauge pod for 1970 - 1980 Trans Am WITHOUT computers. This is an accordion style shift boot for 70-81 Camaro and Trans Am with manual transmission. This is the upper shift boot found on manual transmission cars. This one wraps tightly against the shifter handle and looks like an accordion in shape. This is a lower shift boot for 70-81 Camaro and Trans Am with 3 and 4 speed manual transmissions. Unit mounts under the accordion shift boot in the center console. This boot is used to prevent excess heat from entering the cabin along with road noise. The accordion shift boot mounts on top of this unit. This is a new replacement center console forward facing map pocket. New!! Overdrive Shift plate insert. This is not a thin sticker. This a thick peel and stick polished plastic plate. The factory shift indicator is in the dash and is often broke. Parts to repair the factory set up are hard to come by. This insert is a great way to know what gear you are in!! This is a NEW Shift indicator insert. This is not a thin sticker. This a thick peel and stick polished plastic plate. What makes this item unique is you cqan apply this OVER your existing lens without having to take apart the factory shifter bezel assembly, simply clean the existing lens area and this aplies directly over it while the shifter bezel in still installed in the car! This is a 70 - 81 Trans Am shifter knob set with clips. Includes new replacement Hog Ring Clip and button clip. Also includes red bird knob button as well as the automatic shifter knob itself. 1970 - 1981 Firebird Trans Am RED Bird Shifter Knob Set NEW! 1970 - 1981 Firebird Trans Am GOLD Bird Shifter Knob Set NEW! This is a new custom true leather wrapped shifter knob for 1970 - 1981 Trans Am. This is a 89 piece interior screw kit for 1970-1981 Trans Am and Firebird with T Top. NEW COLOR OPTION: STANDARD, ALL BLACK.